Successfully Added VAG-COM Tacho 2.5 USB to OBD-II Interface Cable to your Shopping Cart. This VAG-COM Tacho 2.5 USB to OBD-II interface cable is used for reading data from VW, Audi, Seat, Skoda and certain other car brands and models. This VAG-COM, VAT-ISO OBD II style cable is an aftermarket tool for transmission protocols with 16pin OBDII style data link connector that supports VDO SEED-KEY protected dashboards. This car diagnostics USB to 16PIN OBD-II cable allows you to read/write EEPROM programming, read PIN codes for new key change and update the millage of your car. 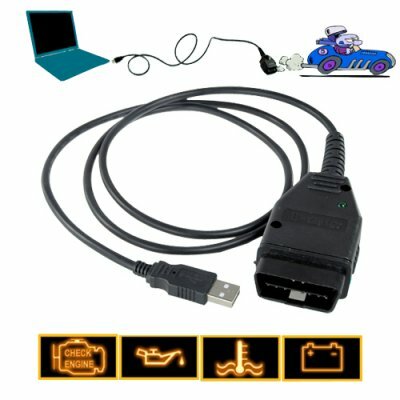 Use your computer and this USB enabled VAG-COM interface cable, and you will be able to instantly modify certain settings and clear errors in your vehicle. Using your computer, the VAG-COM interface cable, and your favorite diagnostic software you can start troubleshooting your own cars and view results within minutes. This model supports VDO SEED-KEY protected dashboards so you can read the Immobilizer PIN code of your car without the need to remove the dash panel. The VAG-COM Tacho 2.5 interface cable is easily connectible to your vehicle through the OBD diagnostics port. There is no doubt that this simple tool is very cost effective, whether you are a mechanic or just a car owner. IMPORTANT NOTE: As the wholesaler, we provide the package containing this car diagnostic and maintenance cable. We cannot give any customer support regarding its use. If you have questions regarding the use of this product you will need to search internet forums related to car care and maintenance. We cannot give any support or advice on how to use this product and we sell it without software. NOTE: The CVFG-A08 works on vehicles that's are VAG compliant. The best way check if your car is compliant with this type of cable is to check the car user manual, contact your car dealer or talk to your favorite mechanic. Can I use this cable with ScanTool.net or Vag-Tacho for Windows or another software called __________that my friend recommended? Yes, it should work with both Vag-Tacho and ScanTool.net for Windows, and it may work with other PC diagnostic software, however we do not provide support or recommendations regarding software for this product. Do I need to have my car running while performing diagnostics? Usually just turning your key to ACC will be enough, but for some tests you might need the engine to be running. I'm not a professional mechanic, can I still use this cable? This cable is designed to be user friendly and easy to understand. Do-it-yourself and home fix-it-up type men (and women) should be able to learn how to use this product given you do your research on how to use the product before purchasing it. What else can this cable do? For all the great uses of this cable, you can visit professional auto maintenance forums on the web, or even better, buy a sample and try it yourself!